Our Derbyshire bed and breakfast also has AA 4 Yellow Stars Highly Commended+ Egg Cup award for breakfasts. 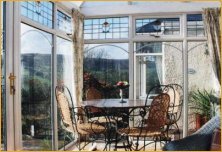 We are delighted to be the only bed and breakfast accommodation in Hathersage to be recommended by Holiday Which, and have been recommended by Country walking magazine "Expect a warm welcome, and a hearty breakfast, served in the conservatory so you get great views". Cannon Croft is a discerning, award winning bed and breakfast accommodation for those in search of independantly proven quality, situated in the picturesque village of Hathersage, which nestles in one of Britain's areas of outstanding beauty, the Peak District National Park. All the bedrooms of our family run bed and breakfast have been individually designed to give maximum comfort and aesthetic pleasure to our guests. They are all en-suite and equipped with colour TVs, VCRs clock radios, hair dryers, well-stocked hospitality trays, toiletries plus lots of extras not normally found in other bed and breakfast accommodation. We can accommodate double, twin or treble requirements. Cannon Croft bed and breakfast is hidden away, approximately 150 meters from the road, with plenty of private parking. We are not licensed, however if you would like to "bring your own" we will happily provide the glasses. We are a non-smoking establishment and regretfully can not take children or pets. Check in time on day of arrival is between 4.30 pm and 5.30 pm and rooms should be vacated by 10.30 on day of departure. Please ask, at the time of booking, if any variation is required.